Prosecutors in Brazil have begun legal action against a leading construction company, Odebrecht, accusing it of maintaining 500 Brazilian workers in "slave-like conditions" in Angola. Prosecutors say Odebrecht committed "human trafficking" while transporting workers to a biofuel plant. 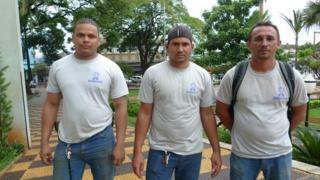 They are demanding 500m reais ($220m; £130m) in compensation for workers. Odebrecht said it would only respond after being officially notified of the legal action. Odebrecht is Latin America's biggest construction company. It was founded as a building company in 1941, but now operates in other sectors such as petrochemicals, oil, weapons and agribusiness. It has been working in Angola since 1984 and is considered the biggest private employer in the former Portuguese colony, with about 20,000 workers. The complaint, filed on Friday in the Labour Court of Araraquara by prosecutor Rafael Araujo Gomes, relates to the construction of a biofuel plant in Angola. The case follows claims made by workers in a story published by BBC Brasil in December. The prosecutor also notified the federal police and federal prosecutors about the legal action which could mean that company directors could also face criminal charges. According to documents filed by prosecutors, "workers, hundreds of them, were subjected to degrading working conditions incompatible with human dignity, and had their freedom curtailed, being deprived of their right to come and go". The complaint says that employees "were treated as modern slaves" and this was aggravated because "they were alone in a foreign country far away, unable to resist". The prosecutor says instead of asking the Brazilian embassy in Angola for work visas for the workers, the company asked for ordinary visas, which did not grant them the right to work. He also alleges Odebrecht "shamelessly lied to the Embassy of Angola", saying the workers would travel to the African country "on business" and would remain there for fewer than 30 days (the limit set for a visit under an ordinary visa). However, airline tickets purchased by Odebrecht showed the workers would be returning after a time span longer than 30 days. According to the prosecutor, the company used the scheme to "rely on precarious workers, unable to react or complain about the conditions, unable to find another job, and who could not even leave the construction site". Image caption The workers said they felt unable to resist because they were "alone in a foreign country far away"
According to the legal documents, the workers were subjected to a number of risks in Angola, including imprisonment. The documents also allege that the way the workers were treated violated international treaties against human trafficking. Under the Palermo Protocols, which Brazil has signed, human trafficking can involve using people to work when they are being forced or deceived about the conditions in which they will be employed, or if they are kept in a "vulnerable situation". The prosecutor wants Odebrecht to pay compensation of 500m reais to workers and also wants public banks to suspend their loans to the company. There is a further demand that the company pay a fine of between 0.1% and 20% of its gross annual revenue. According to the prosecutor, the case requires "an absolutely exemplary punishment" so that the company will not "feel encouraged to repeat the same behaviour in the future".